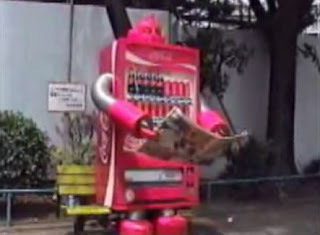 Don't know much about it, but it looks like this walking humanoid vending machine is a mascot of a Coke's campaign in Japan. There are a couple of videos on YouTube (here's one). Apparently, the robot is cast in a superhero role, too. Japan Probe also writes about plans by a Japanese company to install vending machines that would dispense stuff at lower prices or for free in exchange for viewing ads.